The four townhouse-style apartments, the “Tom and Ryan Cook Village,” will be placed in a “U” design along 11th and 12th streets and Lincoln Avenue, a configuration that will give them a shared quadrangle-style backyard. Construction began earlier this month with completion in time for the 2013-14 school year. The total project cost is approximately $3.6 million. The addition is timely, with Hope currently experiencing an enrollment boom. Overall enrollment during 2011-12 was 3,249 students, a record high for the college. Hope enrolled its largest freshman class ever, some 848 students, in the fall of 2011, and is anticipating an even larger incoming class, likely more than 900 students, this year. The exterior design will feature large back porches meant to make a focal point of the quadrangle space created by the four structures. Sidewalks through the space are planned to help make the site a more welcoming backyard for the residents and an integral part of the campus. “From a programmatic standpoint, it connects the core campus with some of the other facilities on the eastern side of campus, and provides a high-end apartment-style residential opportunity for some of our upper-level students,” said Dr. James E. Bultman, president of Hope College. Bultman noted that Hope has sought to develop a project that will blend well into the existing neighborhood, which includes not only the DeVos Fieldhouse to the north and college-owned houses to the west, but private residences to the east and south. Built of brick and featuring the Flemish-style architecture and angled roofs of campus landmarks like the Van Wylen Library and other recent additions to the campus, the two-story buildings are designed to offer apartment-style living in space designed from the ground up with students in mind, according to Dr. Richard Frost, who is vice president for student development and dean of students at Hope. “Our priority was to develop the right kind of housing for Hope students and the Hope College experience, to support community as well as the academic mission of the college,” he said. Two of the units will be duplexes housing 10 students on each side, and two will be single structures housing 10 students each. The overall complex will be co-educational, but each of the six units will be single-gender, housing either men or women. Each unit will total between 4,800 and 4,900 square feet, and will include five double-occupancy bedrooms spread across the first and second floors, a first-floor kitchen and living room, small study areas on the top floor and a large study area/meeting room on the basement/ground level. Approximately 2,450 of the college’s students live on-campus. Hope has 11 residence halls ranging in capacity from 48 to 265, 19 apartment facilities and approximately 70 cottages, houses on or near campus that serve as student residences. The new units, Frost said, are meant to capture the home-like atmosphere of the cottages but with amenities that complement having 10 students living together, like three full bathrooms, two refrigerators and air conditioning. While the new buildings will help accommodate Hope’s enlarged enrollment, in the long term the college plans to retire some of the cottages that have been in use for many years. 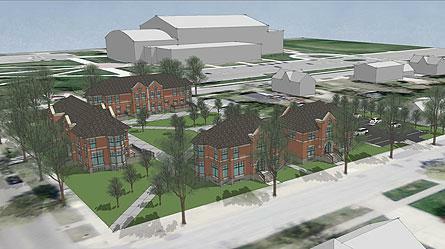 Architectural design for the project was by Design Plus Inc. of Grand Rapids. The construction manager is Lakewood Construction of Holland. The complex is being named in honor of a major gift to the college from the Peter C. and Emajean Cook Foundation. Thomas M. Cook of Grand Rapids and Ryan T. Cook of Ada are a son and grandson respectively of the late Peter C. and Emajean Cook. Father and son, Thomas and Ryan graduated from Hope in 1967 and 1996 respectively. The college’s Cook residence hall on 10th Street, which was completed in 1997 and expanded in 2006, is named in honor of Peter C. and Emajean Cook.